You know how it is these days – there are just way too many passwords to remember what with numerous user accounts of various social networking sites, emails and what not. Not only that, no longer can you just use “password” as your password, as many sites require a minimum length of characters as well as a healthy mix of numbers and letter. Well, the Password Vault will definitely come in handy, as this smartphone sized device is capable of holding account information for website addresses, usernames, passwords, and ATM PINs securely, storing them for immediate retrieval. It will work differently from password information that is stored on a computer, since your passwords are stored offline in the vault’s memory. This makes sure that sensitive information within can never be compromised – not unless someone close to you nicks it away and uses brute force hacking to figure out its content. 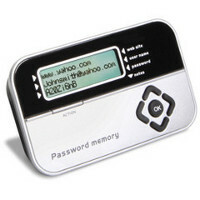 The Password Vault comes with a slide out keyboard, where you can also key in additional text notes and accounts after, surprise surprise, entering an initial password. Capable of storing up to 400 account records, it will certainly do its bit in mitigating the risky practice of leaving passwords on notes under keyboards or using a master password for every single account in your possession. Buttons can be used to scroll between accounts for display on the LCD screen. Just in case you happen to have your precious Password Vault misplaced, lost, or stolen, all it takes are five unsuccessful attempts to access your accounts and the device will lock itself for 30 minutes, making sure your passwords remain safely protected. Pressing the reset button does exactly what it says – all data within will be permanently erased, so hopefully there is some sort of fail safe procedure there that requires you to key in yet another password to confirm the reset, otherwise the itchy fingers of an inquisitive kid might just do in your entire password collection. At least it sports a built-in flash memory that ensures all of your passwords are retained in memory even when the CR2032 battery required is dead and has to be changed. At $49.95 a pop, this is certainly shaping up to be a pretty neat Christmas present for anyone who uses the computer a whole lot! Now if I can only remember my initial password to gain access to the Password Vault.